This is a 45 minute session dedicated to truly relaxing and practicing breathing for labour. Spend time thinking what you will do during your labour. Practice will help these skills to become 2nd nature to you so that when your labour begins you know what to expect and what to do. We do deep breathing, relaxation breathing, use affirmations, touch, movement, and vocalisation. When it comes to your labour you might find one thing works better than the other. Relaxation during pregnancy is wonderful for both you and baby too. It helps to reduce stress, increase your sense of well being and gives you time to focus on baby. - Reduces stress good for mum2be and baby. - Learn breathing techniques for labour. - Encourages baby into a optimal birth posistion. Preparing for the arrival of baby probably has probably been your main focus for the last few months from travel systems, to nursery colours to babies first outfit but preparation for your 4th trimester is essential to aid your recovery and healing after baby gets here. A 45minute session to guide you through 20 ways to support and enhance your recovery. Labour and caring for baby is covered in antenatal classes but what about you? 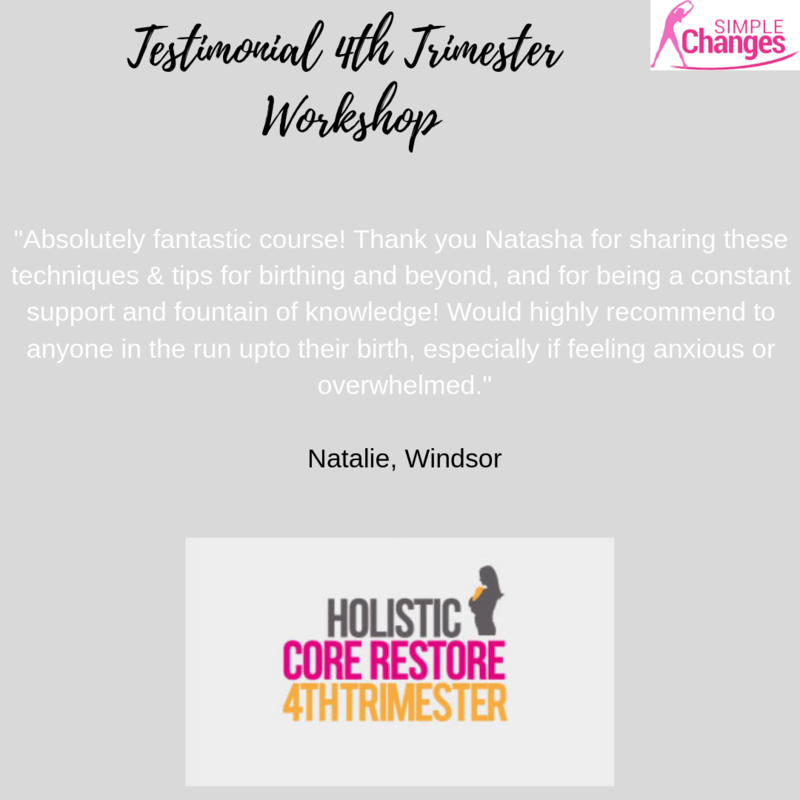 Holistic Core Restore ® : 4th Trimester is a 45minute session looking at support, nutrition, posture, connecting with your core, lifting correctly and so much more. Preparation before baby gets here is so important. It is such a massive learning curve when they do arrive and often you forget about you but with support and guidance you can have a great plan in place. Are you coming towards the end of your Pregnancy and want to be as prepared as possible in your early Post Natal days? Do you need help organizing your Support Systems and the people who can help you so that you have the time and space to truly recover? Are you unclear about how to perform the Pelvic Floor exercises that you were told to perform? "I have attended Natasha’s Mums2be Pregnancy exercise classes and also her Breathing and Deep Relaxation sessions in Datchet. Both classes were fantastic and great preparation for the birth of my son Thomas. It was helpful to interact with other women and share concerns about our impending births. Mums2be classes are great exercise for strengthening and stretching core muscles. Especially if like me, you previously did very little exercise. Deep Breathing and Relaxation sessions were helpfully to understand and practice birthing techniques and different birthing positions. They were a great help in preparing for labour and understanding the birthing process so I was not as scared as I may have been. Natasha is great trainer and very knowledgeable about particular exercises for pregnancy. My three Hour labour is testimonial to that."